Wedding events allowed a day for the guys to play golf and the rest of us to take in some sights in our nation’s capitol. 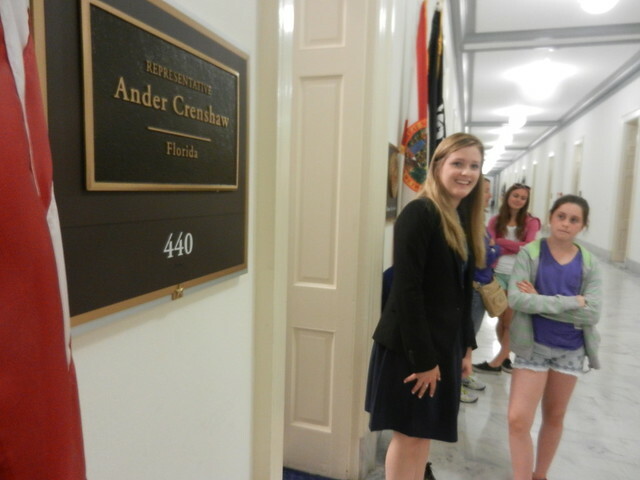 My brother, John, is friends with Congressman Ander Crenshaw from Florida, which came in handy for us sightseers. 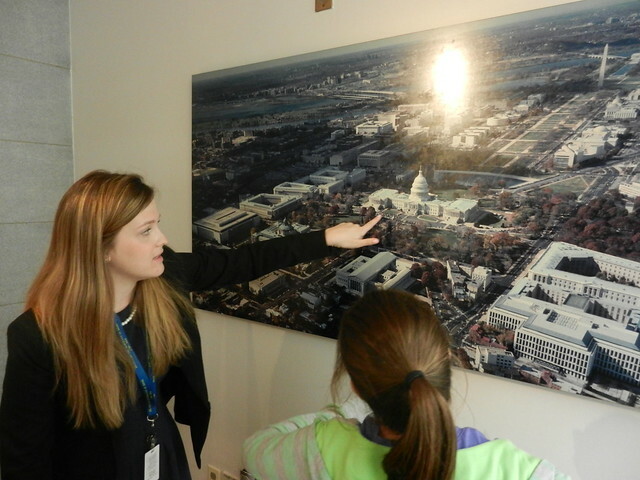 A prearranged tour of the Capital Building with Crenshaw’s intern inspired us to make the drive into D.C. and brave the hunt for a parking space. In hindsight, I should have taken a picture of one of those streets, just as a record. We were advised by veteran DCers to abide by every word on the parking signs or we would surely end up with a ticket. We were glad we didn’t give up. 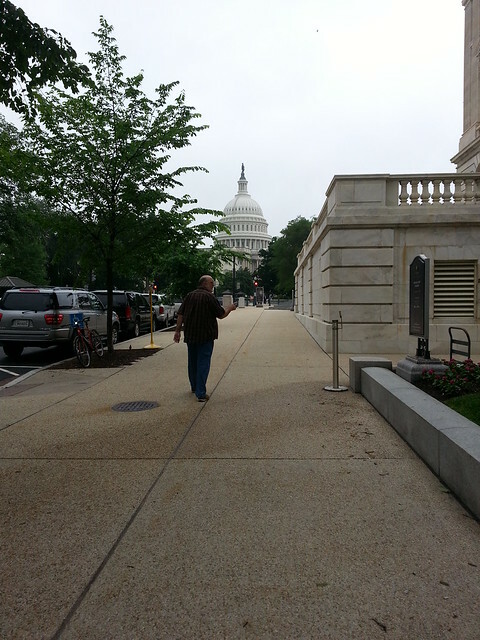 Here’s Mauri at the entrance to the Cannon Building. At the entrance a few things caught our attention. This, of course. 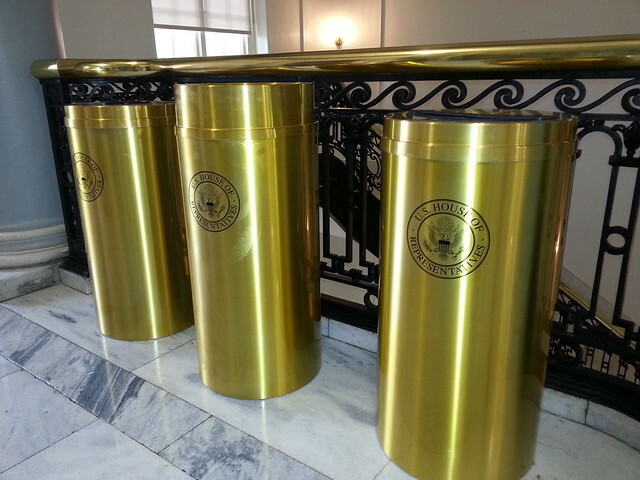 And these classy trash receptacles. 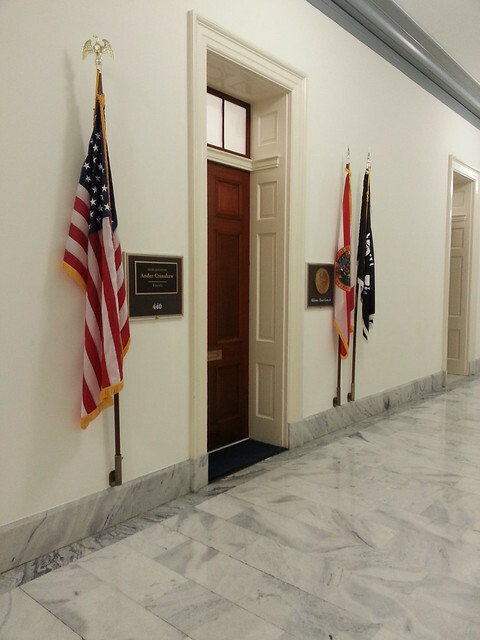 On the fourth floor we found Congressman Crenshaw’s office, where we were to meet the rest of our family (two other cars driving around to find parking). 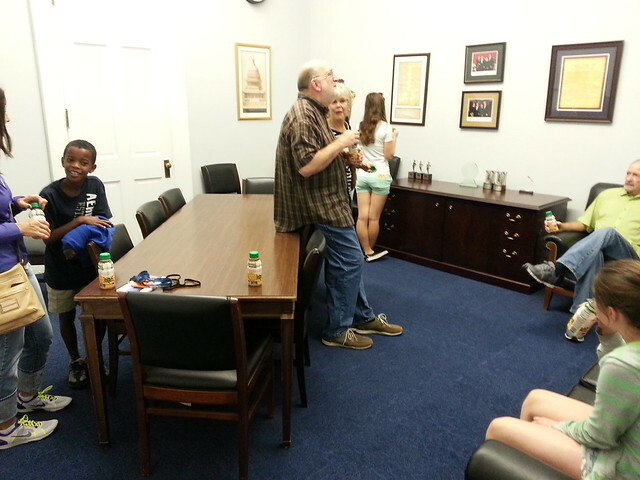 We were ushered to wait for the others in this room and offered bottles of Florida OJ (since he represents Florida). Also we were asked to turn over any food we carried in. 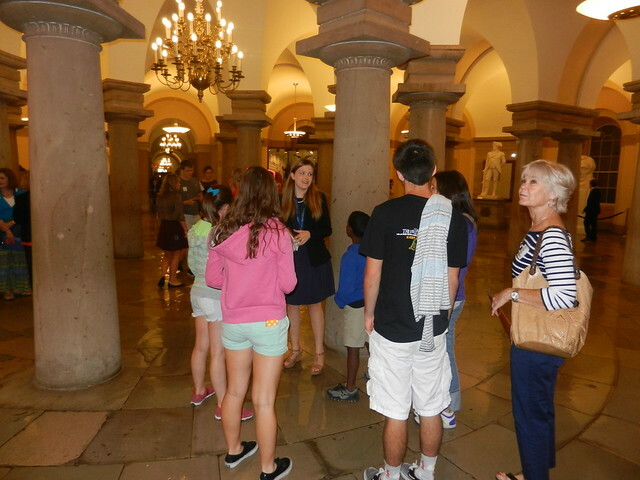 Intern Christa from Germany would patiently guide us through many interesting places. 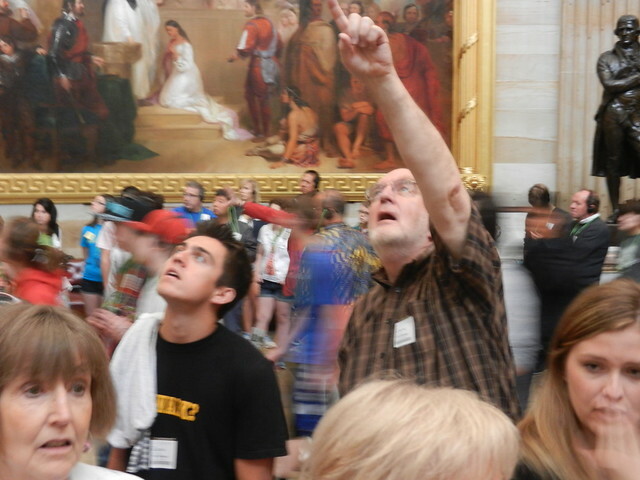 We looked up a lot. 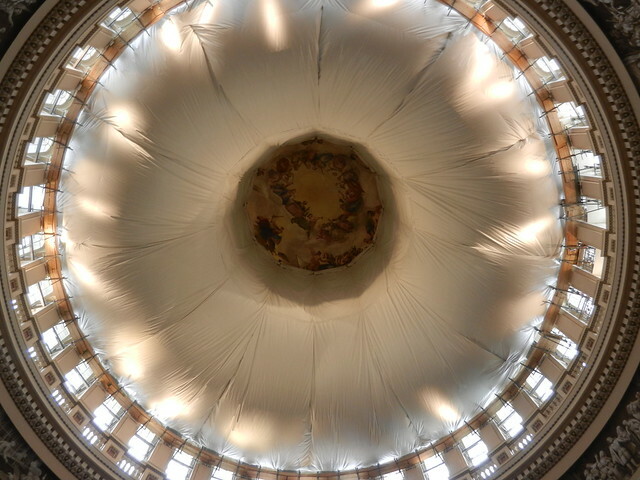 The dome is undergoing some renovation, and they’ve placed this “doughnut” around it to keep debris from falling on us. 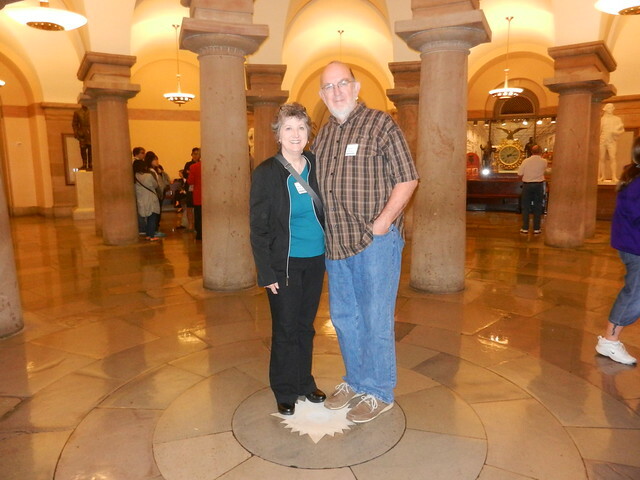 This is the center of the Capitol, and those who stand on the spot have good luck. If we win the lottery, we’ll share. 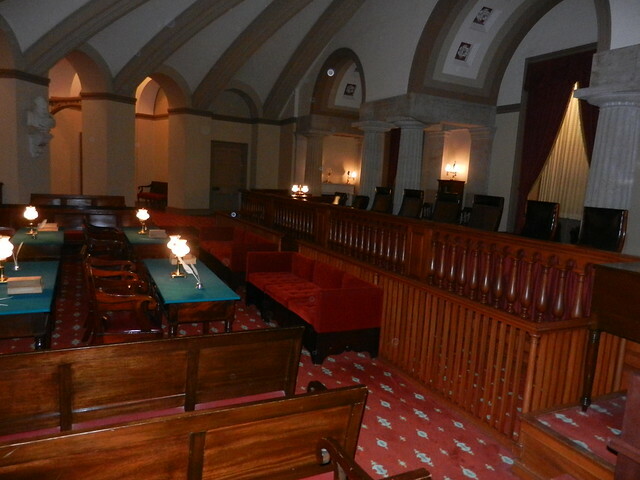 Abraham tried a case in this courtroom. He lost. 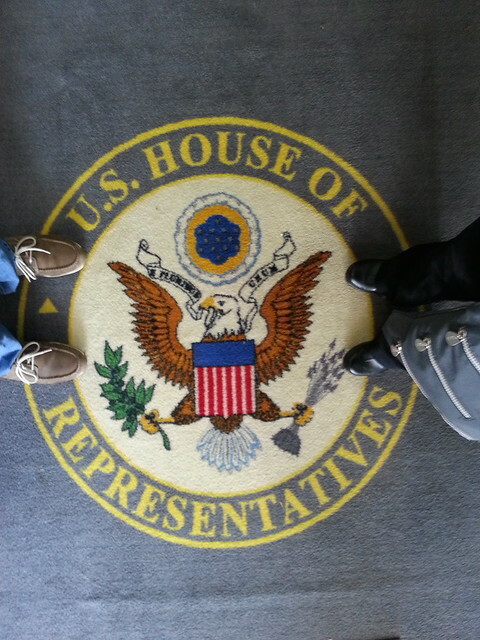 At one point in the tour we had to turn in all of our electronics, cameras, and key fobs in order to sit in on a session of the House of Representatives. Fascinating, just being in the room where important decisions are made that affect our future! Of course, no phone or camera means no pictures. This room has a whisper spot—and it actually worked for us! The man understands acoustics and explained (to me) how it works. Christa showed us how far we’d walked. 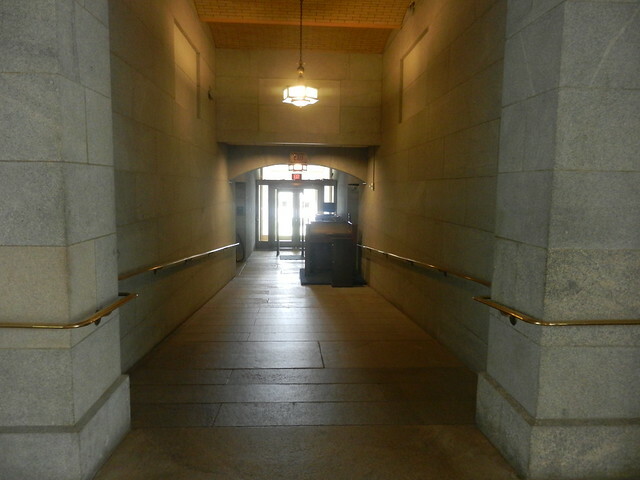 All of the buildings in the Capitol are connected by underground tunnels, and we walked quite a few of them. On our way to the next tunnel, we were taken here. 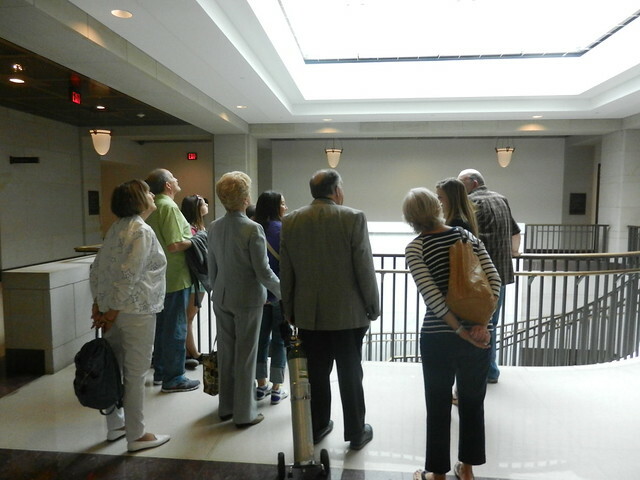 We stood and took in the fact that each President about to be sworn in walks this hallway to the doors that open into the balcony where his inaugural speech is given. Here’s a better look out the window. 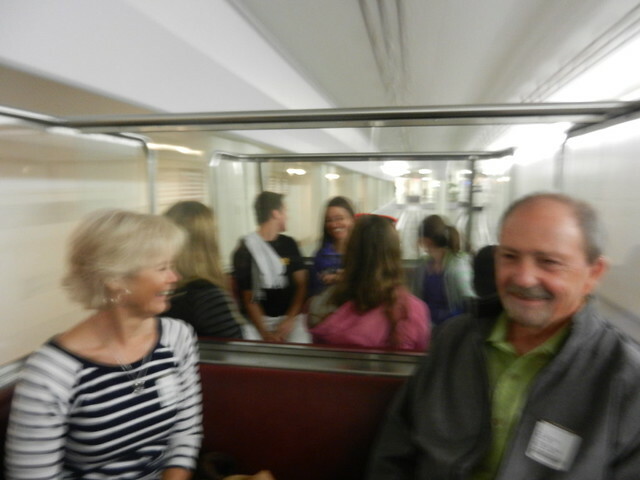 To spare us the long walk back, we got to ride the train. And Christa didn’t even know how far we still had to walk to our car. But no ticket! Very, very cool! 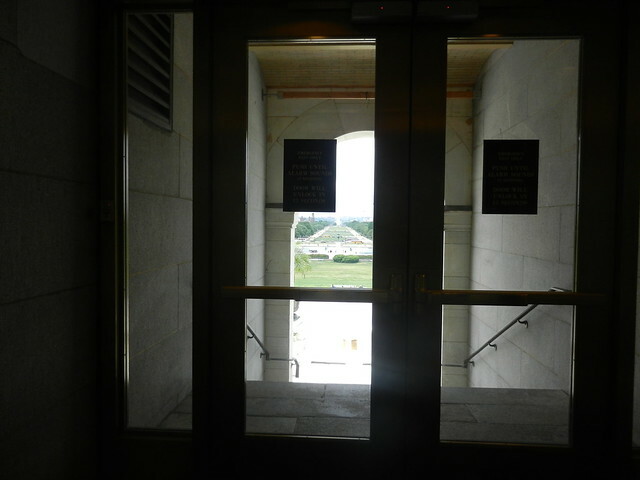 The Capitol is so very closed off now (post-9-11) so most people don’t get to see all that stuff like we could in the good ‘ol days. Awesome adventures. You have such a gift for writing and makes it fun to tag along. 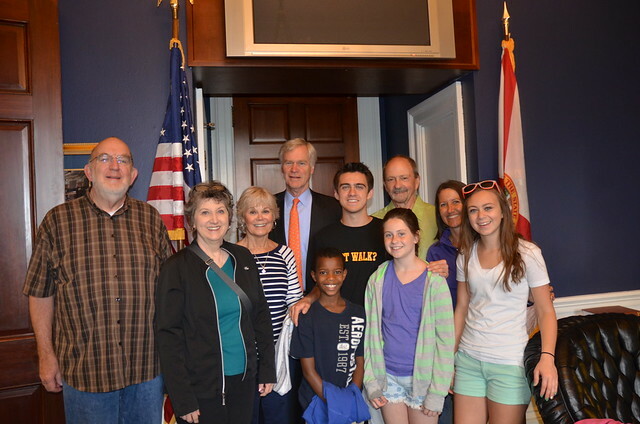 So glad that your family could make the trip and enjoy this special time together. 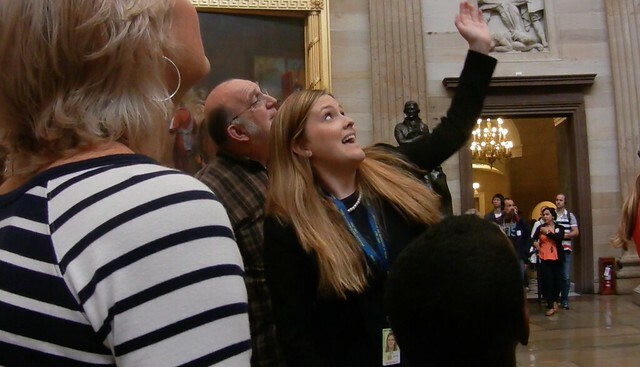 How wonderful that you were able to get a tour of the “off limits” places. 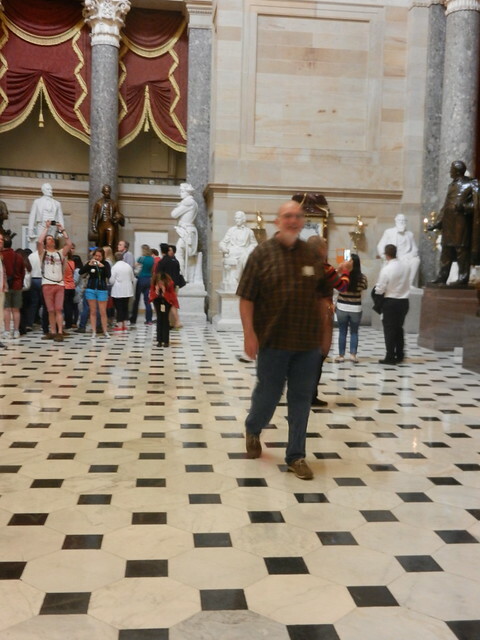 I was able to do the DC tour with my Dad when I was about 13 and then again with Wally in 1980. 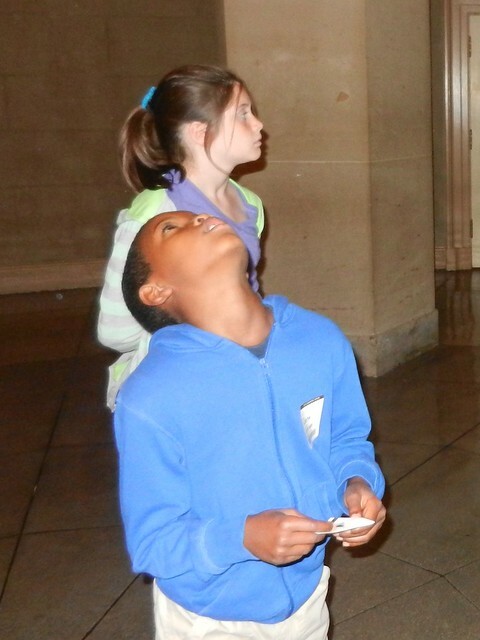 There is so much to see there, it would take a year to do it all!